Active Boys Need Lots of Nutritious Food! For several years, Fair Play received funding from USDA through their school breakfast and lunch programs. These programs provide cash assistance to states to operate nonprofit breakfast and lunch programs in schools and residential childcare institutions. While these programs provided much needed funding, a difficulty complying with the regulations arose. "Their standards are based off of traditional schools," Daniel Hochstetler, executive director, explains. "It's designed for kids sitting in a classroom. Our campers are so much more active. Boys are walking trails, working hard, and playing physical games, so they're naturally getting in shape. Consequently, they are burning a lot of calories. 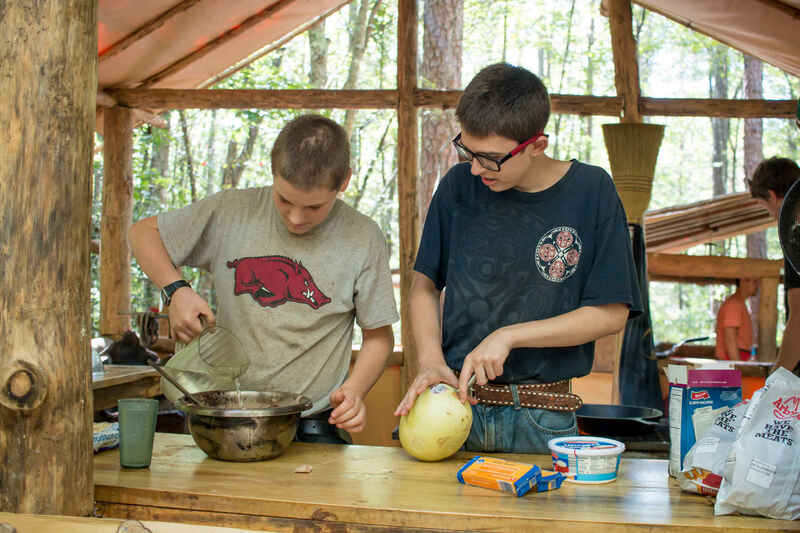 If we stayed with USDA standards, our campers would have been hungry all the time. Imagine using four dozen eggs to feed all of Chuckwagon for breakfast. That's not going to feed 40 hungry boys who are active and enjoying life. Subsequently, last year we reluctantly ended our partnership with USDA." You can help make up for the difference that was lost from USDA. $20.00 per month will replace USDA funding for a boy's breakfast and lunch for a week. $40.00 per month will cover two weeks. And for $87.00 per month, you can replace USDA for a boy's breakfast and lunch for a month.